Rhino-Rack Luggage Bags feature heavy duty water repllent lockable zippers with pull tags. They also have a protective velcro flap that keeps your gear safe from the elements. Extra heavy duty abrasion resistant base decreases wear and is 100 % dust and water resistant, even up to 24 hours of torrential rain. The securing straps have a heavy duty buckle to easily secure the luggage bag to a basket without the need of a tiedown strap. The bag is protected from wear and tear by the removable polyvinyl liner, making it easier to clean. 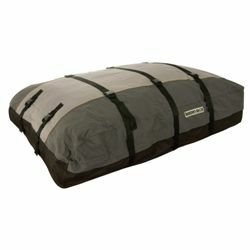 Luggage bags are for use with Rhino-Rack Roof Baskets and are backed by a 1 year warranty.